New Products « Categories « Appealing Products, Inc. Appealing Product’s Inc. now has a low-cost detector for Formaldehyde. Users are able to easily detect Formaldehyde in Foods such as Fish, Meat, Cheese and Liquids. For more information, please visit; http://formaldehydetests.com/formaldehyde-swab-detector. 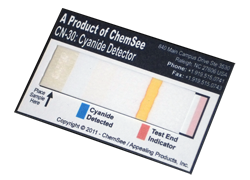 Appealing Products, Inc. is pleased to announce the addition of another member of its detection family: CyanideTest.com. This site provides information and resources on cyanide exposure, poisoning and detection, as well as low-cost, simple tests for cyanide in food and water. ChemSee has developed an easy-to-use, low-cost detector and identifier for fertilizers which can be used to make explosives. The analysis takes less than five minutes.